James Comey is biased, but not in the way you think. It’s not that he’s partisan. It’s that he’s blind to his own biases, which helped Trump get elected. FBI Director James Comey looks on during a meeting in Washington on April 18. Why did FBI Director James Comey issue a last-minute letter about Hillary Clinton’s emails that may have tipped the outcome of the 2016 election? Why did he rebuke Clinton earlier that summer, breaking with FBI protocol? Why did he speak publicly about the investigation, even as he chose not to disclose the FBI’s inquiry into Russian contacts with associates of Donald Trump? Critics believe that Comey did these things to hurt Clinton. Defenders believe that he played it straight and that objective factors—for example, that the Clinton investigation was closed, whereas the Trump investigation was open—explain why he treated the two cases differently. But maybe the story is more complicated. Maybe, while trying to play it straight, Comey was biased in ways he didn’t understand. Comey’s thinking and behavior, detailed in a New York Times story over the weekend, illustrate how this can happen. The article concludes that “partisanship was not a factor” in his discrepant treatment of the two investigations. But political factors did affect his calculations and decisions. These factors were all the more powerful because Comey didn’t recognize their influence on him. He was blinded by faith in his own integrity. Comey was serving, at that time, in a Democratic administration. His boss, Attorney General Loretta Lynch, was cautioning him to tone down his public descriptions of the Clinton investigation. (The Times says she wanted him to call it a “matter” rather than an investigation.) According to the article, this fed Comey’s “distrust of senior officials at the Justice Department, who he and other FBI officials felt had provided Mrs. Clinton with political cover.” This brewing distrust led Comey to separate from Lynch and present the investigation’s findings, in a July 5 press conference, with a rebuke of Clinton, rather than close the case quietly. In Comey’s mind, he wasn’t introducing bias. He was fighting it. He also believed that his decisions about Lynch were based on objective assessments of public perceptions. One example was her June 27 conversation with former President Bill Clinton on an airport tarmac. The encounter outraged Republicans and “was soon the talk of Washington,” the Times notes. Comey concluded that regardless of what Lynch and Bill Clinton had discussed, she could no longer deliver a credible verdict. He also worried about a memo, hacked by Russia, in which a Democratic operative had suggested that Lynch would limit the investigation. The memo seemed speculative, but Comey worried that Russia might leak it, thereby casting doubt on any decision announced by Lynch. In both cases, Comey imagined that he wasn’t passing judgment on Lynch. He was just protecting the investigation’s credibility. When it came time to announce his conclusions, Comey crafted what he thought was a balanced presentation. He was closing the case without charges. Therefore, to offset that decision, he detailed Clinton’s failings and called her “extremely careless.” According to close associates and former agents interviewed by the Times, Comey did this in part as a gesture to his own agents, many of whom were outraged by Clinton’s conduct, and in part “to insulate the FBI from Republican criticism that it was too lenient toward a Democrat.” Comey wasn’t trying to smear Clinton. He was just evening things out. Comey’s deference to Republican criticism, as an index by which to measure his fairness, made him vulnerable to pressure. By raising their voices and crying foul at the slightest deviation from their demands, Republicans made it seem that the fair position was closer to their side. Apparently, this influenced Comey’s decision to issue his Oct. 28 letter, which announced the discovery of potentially new evidence against Clinton just days before the election. The putative evidence turned out to be nothing. 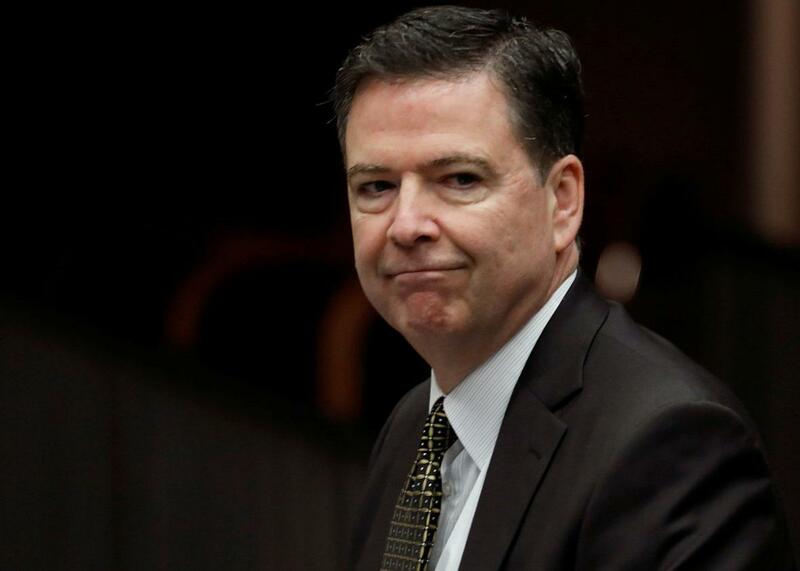 But the Times describes a drumbeat of conservative media outrage leading up to his decision (“James Comey’s Dereliction,” said the cover of National Review), along with trepidation within the FBI at the prospect of Republican-led hearings. That quote, proudly recounted by Comey at a subsequent meeting of FBI agents, is the lede of the Times story. The next 7,000 words destroy it. At every turn, Comey and his colleagues considered who might be affected, especially their own bureau. But all of their worries focused on a Clinton victory scenario. The possibility that Trump might win, and that Comey might be second-guessed for sending the October letter, rather than not sending it, seems not to have figured much in their deliberations. It’s easy, in retrospect, to accuse Comey of partisan motives. But it’s hard to square that theory with other details reported by the Times. You’d have to explain why, after Comey was briefed on Christopher Steele’s dossier of contacts between Russians and Trump associates, the FBI offered Steele $50,000 to corroborate his information. And you’d have to explain why Comey asked the White House, unsuccessfully, for permission to publish an op-ed warning the public about Russian interference in the election. It’s also easy to condemn Comey as naïve for not seeing how politics warped his thinking. But in this, he wasn’t alone. The Times reports that when Comey proposed his op-ed about Russian interference, President Obama vetoed the idea, worrying that “Republicans could accuse the White House of stoking national security fears to help Mrs. Clinton.” And when Comey wanted to send his October letter, Lynch chose not to overrule him, fearing that she’d be accused of political interference. Obama and Lynch, like Comey, saw Clinton as the candidate with the most to lose. They worried more about the risks of intervening than about the risks of not intervening. If we’re wise, and if we’re honest with ourselves, this isn’t the story of a malicious prosecutor or a fool who couldn’t see what was staring him in the face. It’s the story of an honest man whose methods of seeking fairness—resisting political pressure, striving for even-handedness, scrutinizing the powerful, maintaining public confidence—made him susceptible to subtle structural biases. It could have happened to any of us. And it does happen to all of us, in small ways, every day. It happened to Obama, who spent much of his presidency striving for a middle ground that drifted to the right as Republicans hardened their demands. It happened to the Times, which focused its scrutiny on Clinton because she, not Trump, seemed likely to become the next president. It happens to professors and college students who insist that conservative speakers on campus, but not liberals, be confined to debates or panel discussions where their views can be “challenged. “It’s easy to see this blindness in other people, particularly in your enemies. Maybe, having read Comey’s story, we can learn to recognize it in ourselves.